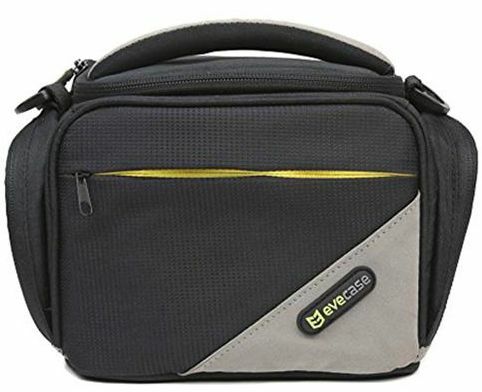 Evecase large digital camera nylon case with strap - black evecase high quality case. Closed cell foam padding for great protection. Rugged nylon materials. Large front zipper pocket for accessories. Two side pockets for lens caps and filters storing. Two inner Velcro top pockets for memory cards storing. Clip-on detachable and adjustable strap included for your convenience. Adjustable inner divider to hold camera more sturdy and keep accessories apart. Alti-slip top handle for easy carrying, allows you to grab and go. Inner size: l x w x h : 7.06 x 4.75 x 5.60 Inch (camera and accessories not included.) Compatible with: canon xc10, eos sl1, t6s, t6i, t5, t5i, t4i , t3 , t3i , t2i , t1i, xsi, xti, xs, 60d, 6d, 60da, powers hot sx60 hs, sx50 hs, sx40 hs, sx410 is, sx530 hs, sx520, sx510 hs, sx500 is Nikon Coolpix b500, b700, l840 l830 l820 l810 p900 p610 p600 p530 p520 p510 p500 l340 l330 l310, dl24-500, slr d5500 d5300 d7100 d5100 d3300 d3100 d7000 d5000 d3000 d90 d600 d700 Olympus e-m1, e-m5, e-m10, stylus 1/1s, sp-610uz, sp-800uz, Panasonic dmc-lz40, lz20, fz300, fz1000, fz70, fz60, fz200, fz150k, fz47, fz40, fz100, fz35, fz28, gf3, gf5, gf2 Fujifilm finepix s9900, s9800, s9400, s9200, s8400w, s4800 / s4600 / s4700, s6800 / s6600 / s6700, s8400 / s8500, s8200/s8300, sl1000, s4200, s4500, sl300, x100, s3200, s4000, s2950 Samsung nx, nx30, nx20 Ricoh/Pentax k-3 ii, k-s2, k-s1, k-3, k-500, k-50, k-5 ii, x-5, k-30, k-01, 645d, k-5, k-r, x90, k-7, k-x note: please check your dslr camera kit dimension whether suit this case before purchasing.